Within short walking distance from the hotel is the Cape St. George Lighthouse. The fourth reconstruction of the lighthouse originally located on Little St. George, is now located in the center of St. George Island. Climb the 92 stairs up to the top for a gorgeous bird’s eye view of the Gulf of Mexico and Apalachicola Bay. 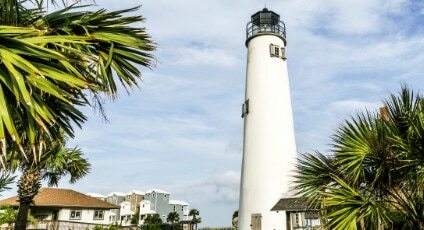 After you’re done enjoying the stunning view, go downstairs to the museum to learn more about the history of the lighthouse and purchase a souvenir from the gift shop to remember the amazing time you had visiting St. George Island!